The International Swimming Hall of Fame announced that Dale Petranech was honored with the 2019 ISHOF Service Award. Brent Rutemiller explains the award and its latest recipient, "The ISHOF Specialty Awards are presented annually to individuals for outstanding contributions to aquatics. This year’s awards will be presented on May 17th in conjunction with the Paragon Awards on the 55th Annual Hall of Fame Honoree Weekend on May 17th - 19th in Fort Lauderdale. The ISHOF Service Award is given periodically to an individual who has selflessly volunteered their time, energy, and/or resources to advance the interests and work of the IMSHOF. Dale has been a fixture at the Hall of Fame for as far back as anyone can remember. Whatever needed to be done, Dale was always there to pitch in and lend a helping hand. Whether it was getting up at 4:00 am to help ISHOF’s own, Bob Duenkel set up for the Ocean Mile Swim or make a last-minute run to the Miami International Airport to pick someone up, Dale always did it with a smile on his face. And he never said no. Dale became involved in swimming on an administrative level in 1977, when he was selected to be the chairman of the first USA Swimming Open Water Committee and developed successful domestic and international programs. In 1984, Petranech was instrumental in getting FINA President Bob Helmick to establish a commission to study adding open water swimming to the FINA and Olympic programs. Under Petranech’s leadership as chairman, in 1991, the first FINA 25 km marathon swim was swum in Perth, Australia at the 1991 FINA World Aquatic Championships. 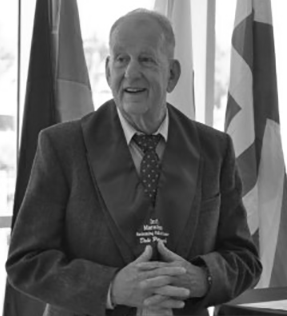 In 1998, Dale became the Secretary General for the Marathon Swimming Hall of Fame and has since been responsible for formulating the nomination ballots and organizing the annual IMSHOF inductions. He is an accomplished open water swimmer is his own right. In 1985, he became the oldest person to swim the 21-mile Catalina Channel at the age of 50. All these accomplishments are just another part of Dale’s history and background, but to us, Dale is just another member of the family. Another person we can turn to when we need someone to set up tables, get the flags ready for the Honoree parade, help run an important errand, or just count on when you really need someone. There are not many people like that anymore these days."